Amy and her plane were lost off the shores of Herne Bay in 1941. She was 37 years old, serving her country. Despite a dramatic rescue attempt, in which the captain of the rescue vessel also died, neither her body nor the wreckage of the plane have ever been found. I saw this bronze statue in memoriam along the promenade at Herne Bay. It was beautiful but dark and shining in the sunny weather. I thought I would not be able to get a good shot of it but, after a think about settings, I at least, managed this portrait shot. This works really well, so much better than trying to get the full statue into the frame. Lovely memorial of this brave woman. Wonderful shot and poignant homage to this spunky aviator. 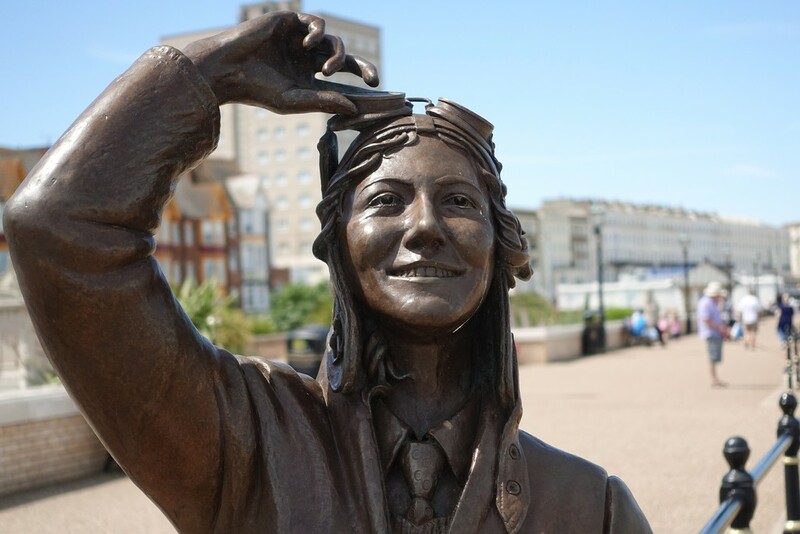 Love the story of Amy Johnson and all the pioneers of flight. Lovely statue. I just received your book "Till We Meet Again" through the post 5 minutes ago! It looks fantastic and I know my hubby will love it, so will our teenager and I shall sneak a read myself once they have read it. Well done, you have created a fabulous image. You could always read it first?! Love the portrait,she was a very brave lady, it's nice to see this tribute. Love your story, Hazel. Nice to see this image. You have captured so much detail in this statue, particularly as the light was difficult. Oh gosh, Peter, thank you for the details of the tale. What a tragedy! Tragic story - nice shot of the statue though! Brilliant statue. Great joyful expression they have given her.